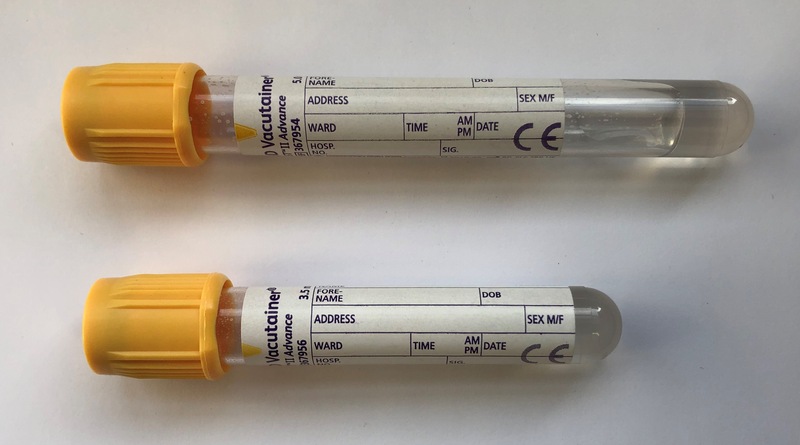 Serum for GAD, IA-2 and ZnT8 testing only: Please send with your local Pathology request form to Blood Sciences Laboratory. GAD Positive: >/= 11 U/mL. Autoantibodies recognising the islet cell antigens glutamic acid decarboxylase (GAD 65), Zinc Transporter 8 (ZnT8) and the insulinoma antigen 2 (IA-2) are present in up to 90% of newly diagnosed patients with type 1 diabetes. The prevalence of GAD, IA-2 and ZnT8 autoantibodies is less than 1% in GCK, HNF1A and HNF4A MODY, and testing for these autoantibodies close to diagnosis gives very good discrimination of Type 1 diabetes from MODY (McDonald et al 2011 Diabet Med 28:1028-1033). The Blood Sciences department at the Royal Devon & Exeter Hospital offers a highly sensitive, automated ELISA method for the quantitative determination of GAD, IA-2 and ZnT8 autoantibodies in both serum (preferred sample type) and plasma samples. Anti-GAD antibodies in high titre are also associated with the stiff-person syndrome (60% sensitivity), a rare neurological disease characterised by muscle rigidity and spasms. Glutamic acid decarboxylase occurs in two isoforms (GAD 65 and GAD 67); although GAD 67 is only expressed in neuronal tissue, the major target antigen in both syndromes is GAD 65, which is the isoform used in this commercial assay. This investigation is performed at the Royal Devon & Exeter Hospital (Wonford) (type 1 DM and stiff-person syndrome). Brooking H, Ananieva-Jordanova R, Arnold C, Amoroso M, Powell M, Betterle C, Zanchetta R, Furmaniak J, Smith BR. A sensitive non-isotopic assay for GAD65 autoantibodies. Clin Chim Acta. 2003 May; 331(1-2):55-9. Nilson E, Ekholm B, Rees Smith B, Törn C, Hillman M. Calcium addition to EDTA plasma eliminates falsely positive results in the RSR GADAb ELISA. Clin Chim Acta. 2008 Feb; 388(1-2):130-4. A comparison of serum and EDTA plasma in the measurement of glutamic acid decarboxylase autoantibodies (GADA) and autoantibodies to islet antigen-2 (IA-2A) using the RSR radioimmunoassay (RIA) and enzyme linked immunosorbent assay (ELISA) kits. Rahmati K, Lernmark A, Becker C, Foltyn-Zadura A, Larsson K, Ivarsson SA, Törn C. Clin Lab. 2008; 54(7-8):227-35. McDonald TJ, Colclough K, Brown R, Shields B, Shepherd M, Bingley P, Williams A, Hattersley AT, Ellard S. 2011. Islet autoantibodies can discriminate maturity-onset diabetes of the young (MODY) from Type 1 diabetes. Diabet Med 28:1028-1033.